Lol, funny how I got one earlier today and then I see this post. It's cool and all but I kinda wish they left the whole lazer or w/e design out, it kinda makes the front look weird. Nevertheless, It's nice to have and can hold up to 3 games on the backside. i got mine on the 24th and i live in europe lol. i think its great! i love the screen wiper and the covers. Hey protodude so when are the special preorder versions shipping out? You know the ones that come with the dsi kit and the game. Got it yesterday, actually. I kinda like it, with ONE exception... The little inserts that act as a design for the DSi's top? They're kinda... messed up by the design in the protective case thingy... Oh well. Still, really nice. 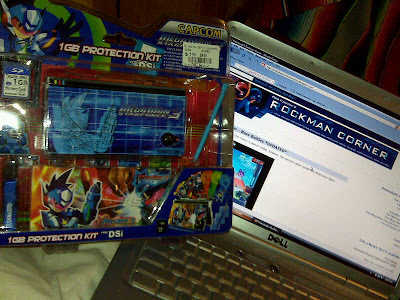 8bit Rockman strap thingy, plus the holder holds three games and two SD cards. Are the DS Lite ones there too? Whats the special preorder versions? @megarock: I've yet to see the DS Lite version in stores. It appears they might be exlusive to Capcom's online bundles. Actually Protodude, they're in Gamestop only, I think. And they have been since Monday, really. Gamestop's had the DSLite versions in stock a lot, but no DSi ones, which is why I ordered mine. I bought my Dsi one from Gamestop. Guess it just varies with each gamestop since I didn't see any DsLite ones.